While HTC’s first two Android phones were standard ‘out-of-the-box’ affairs on the software side, the latest effort – the HTC Hero – features a near-complete UI overhaul called the HTC Sense that not only gives Android some much needed polish (Google isn’t exactly known for eye candy in its User Interfaces) but also puts social networking at its heart. The latter isn’t surprising considering that social networking is currently seen as the “killer” app for mobile and is helping drive up smartphone sales and mobile data usage, therefore loved by handset makers and carriers alike. Having lived with the Hero for over a week, it’s easily the most social networking savvy smartphone I’ve tested, going far deeper than the efforts of most, if not all, of its competitors (I’m still waiting to do a full review of the Palm Pre). For example, while the iPhone has by far the best standalone Facebook app – the Hero sometimes even defers to the web-based mobile version – it’s just that. Standalone. Whereas the Hero takes a people centric approach, peppering a little Facebook integration here and there where most appropriate. 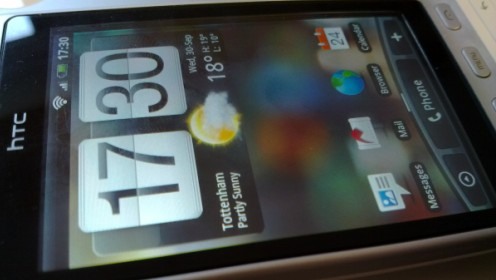 A widget on the home screen with favorite contacts for speed dialing indicates which of those contacts has a new Facebook status update, along with displaying their avatar from the social networking site. Open up the Hero’s full address book and the avatars taken from Facebook, LinkedIn or Gmail are on show for each contact. Click on a contact and scroll horizontally across the lower menu bar and you’ll once again find their latest status update as well as any ‘events’, such as a birthday, all pulled in from Facebook. There’s also a tab for photos from two popular photo sharing sites – Flickr and Facebook – belonging to the accounts of said contact. Again, rather than relying on separate apps for each social networking service, the content is arguably displayed where it should: with the person with whom it’s associated with. Not only is the people-centric approach to integrating social networking sites a very practical way of keeping up with friends’ content, it’s also really fun as there is an element of surprise and added context. The obvious example is that you’re about to call or text a friend, you pull up their contact details and notice they’ve uploaded new photos and updated their status. You’re then more likely to work that into the conversation. Alternatively, you notice a different contact has updated their status and so you decide to give them a call. There is, however, a downside to the idea of converging contact info and content from various social networking services into a unified ‘social address book’, a la INQ, Palm’s WebOS etc. To get it working really well requires quite a bit of intervention. While the Hero tries to guess which contacts should be merged, it doesn’t always get it right and for quite a few contacts I had to manually link them from one service to another or delete duplicates. That’s not such a big deal – you only need to do this once for each contact – but it also has a less obvious effect. That’s probably music to HTC’s ears. Since their isn’t a standard protocol for linking social networking contacts into one converged social address book, if you move to a different device or more likely one from a different handset maker, you’ll have to start over. It’s taken me quite a few days to get the Hero fully working with, not against my social networking accounts and I’m really liking the result. Moving to a different platform – if the Hero was my primary smartphone (hey, I jump devices all the time) – would now be that bit less attractive. 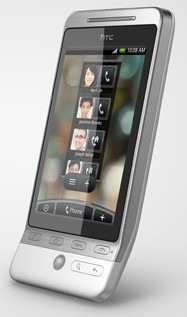 Of course, HTC isn’t the only handset maker who may benefit from this. Motorola’s MotoBlur is attempting something similar, the same with Vodafone’s just announced 360, along with INQ and Palm. It's a nice thing that there are Social Site Phone now. Even whey you're away from the computer, you can still access your facebook, twitter, zipitin or other social networking sites. It will be more easier for us since we're always out of home. As a US Sprint customer, my options have been mostly limited to WinMobile, Blackberry, and Palm. Not interested in blackberry … although i currently own a Palm Centro … although it is a reasably good phone, i have not been suitably impressed with the OS or freeware apps . Yes i said it FREEWARE. There … WinMobile had the market cornered! My mogul was a wonderful little computer … despite the frequent need for soft resets … but a really cruddy phone. When i read about Android i got all excited … but … alas no phones on the Sprint network. Share your review with me at http://www.HTC-Hero.com a site for HTC Hero fans.